Three churches from False Bay Diocese answered the call to join the World Coastal Clean up day on the 15th of Sep.
ow many are your works, Lord! Rev Rachel Mash reminded us that God has given good things to the sea creatures to eat, but now because of the amount of plastic going into the ocean, sea creatures are eating plastic. 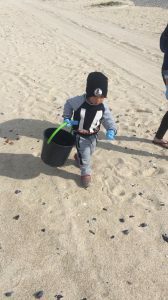 The group set out with enthusiasm to do their bit to help the ocean and showed that none of us is too young to help care for creation!